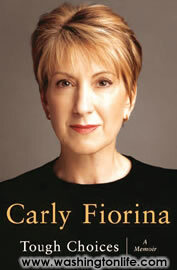 All her life, Carly Fiorina has been a high achiever. 20 years with AT&T and Lucent, including postings in Washington, put her on the corporate fast track. Fortune magazine declared her "the most powerful woman in business" in 1999; soon after, she was named CEO and chairman of the board of Hewlett-Packard. Here, she took an old-school hierarchy into the big business culture of a new century. But change is sometimes a hard pill to swallow. Six years after her hiring—without ceremony—the board fired her. 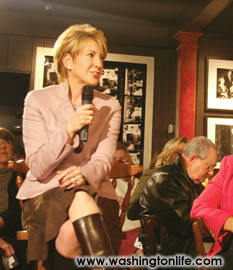 Fiorina reviewed her interesting past and gave a glimpse of her (possibly political) future in a recent interview with Carol Joynt before a sold out audience at The Q&A Café at Nathans. CAROL JOYNT: Let's start with Hewlett-Packard. Why did they hire you as their CEO? CARLY FIORINA: They knew that a very difficult transformation was required. This company was legendary, storied; it was frozen in place and frozen in time. HP missed nine quarters in a row in the middle of the biggest technology upturn in history. Its profit had been deteriorating for five years. Its growth was slowing when we were going through the dotcom boom. The transformation required someone who would respect the culture, but who also would be willing to bend rather than break it. Someone who could both come up with a strategy and a set of goals. They knew they needed a leader who could communicate effectively and inspire people to make tough changes. CJ: They gave you a mandate, and it essentially became almost a journey in hell, right? CF: It was very difficult. The transformation took place during the worst technology recession in 25 years. CJ: And then you had 9/11. CF: September 11th happened the week after we announced the merger with Compaq. Change is a little bit like heaven. Everyone wants to go there, but nobody wants to die. Everybody embraces the need for change, because people logically understand when change is necessary. HP knew they were floundering; as such, the board of the company intellectually said, "Yes, let's go make the tough choices to become once again the leading technology company in the world." When change started to happen, people questioned it and the consequences. On my watch, I had to lay off 36,000 people. Ironically, after I was ousted, people said I was fired because I couldn't cut costs. "ON MY FIRST TRIP TO KOREA, I WAS INVITED TO KISAENG PARTIES, WHERE EACH MAN HAS A FEMALE COMPANION FOR THE DINNER. SO I HAD A FEMALE COMPANION, WE FOUND COMMON GROUND BECAUSE WE SHARED A COMMON EXPERIENCE "
CJ: Did you ever find yourself suppressing your intelligence so as not to threaten men? CF: No. You can learn a lot more by listening than by talking. The interesting part of my career and life is asking many questions and listening to the answers. CJ: In your book there were episodes in which you cried. Then you had an epiphany: you weren't going to cry anymore. CF: I had things happen to me in the work place that were frustrating because they were situations in which my gender made me dismissed or pigeonholed. Once, I had an evening event with senior executives; I was the only woman. The senior executive proceeded to ask me questions that had nothing to do with the work. "What does your husband do?" "Why are you doing this?" "Don't you want to go home and have kids?" It was a very dismissive conversation. I was so frustrated by it that I excused myself and went out in the parking lot crying. I pulled myself together, went back in and finished the evening. When I got home that night, I said "I'm not going to cry any more over other people's prejudices. I'm not going to take inside other people's smaller view of who I should be. I will do what I choose—if they don't like it, it's their problem and not mine." CJ: While you were in Washington, you had experiences that groomed you for HP. People you worked with lied under oath. Did this teach you how to recognize lying, and did that become an essential skill? CF: I was a key witness in a lawsuit around a number of government contracts. I knew people were lying, because I knew the facts. I learned that people will lie. I was quite naive. I am so fortunate that my mother and father stressed integrity, character, candor and truthfulness. CJ: So would you be a good poker player? CF: If it really mattered to me, yes. CJ: You approached your encounters with the media in a very positive way. You handled it well, and then ultimately it came to bite you in the back; people said you liked the media too much. Is there a way you would have done that differently? CF: I did not expect the level of attention that was paid to me when I came to HP. I imagined that when I arrived on the job, the question most asked would be, "Why are you qualified to do the job?" rather than things pertaining to being a woman. No matter what I did, I got it both ways. CJ: You were on the cover of Fortune Magazine, and you were named the top woman in business in the country. You wrote that as much as you liked it, it was lonely. CF: It's a great honor, but for the six years that Fortune said I was the number one, I told them not to make a list. When they number women 1 to 50, it makes business seem like tennis. There's a men's ladder, and there's a women's ladder. The women can't compete against the men, because we're not good enough, strong enough or tough enough. It's the wrong message. CJ: They don't do a list of the top men in business, do they? CJ: You traveled all over the globe and dealt with business leaders in other cultures, particularly with Koreans. Can you tell us the secret to being able to drink a lot? CF: If you want to do business with someone, you have to connect with them and find common ground. On my first trip to Korea, I was invited to kisaeng parties, where each man has a female companion for the dinner. So I had a female companion. We found common ground, because we shared a common experience. Now it turns out that in many Asian cultures, drinking is a big part of doing business. They believe that when the bounds of sobriety are softened, they can assess people's judgment and tenacity. If you ever have to go into a drinking contest, mentally prepare. It's part of doing business. Your job is not to relax and have a good time. Your job is to make it through the contest. Physically prepare; eat the right things ahead of time. Never sip your drink. Your mouth absorbs alcohol more quickly than your stomach. Halfway through the contest, I would say, "Now you need to do me the courtesy of drinking an American drink." I would ask them to drink something that they weren't used to, such as rum or wine. Killed them every time. CJ: Where is corporate hierarchy and the boardroom in terms of diversity? CF: We haven't made much progress if you look at the statistics. I was the first woman to run a Fortune 20 or a Dow 30 company. I was heartened when I was ousted from HP that we had, in rapid succession, three new female CEOs of global companies. On the other hand, the percentage of women who sit in boardrooms today is somewhere between 12 and 16, depending on whose statistics you look at. Additionally, the percentage of female senior officers in corporate America is somewhere between 12 and 16 percent. The pay disparities continue to exist, and it's no longer an issue now of the quality of the feeder pool. It's about people being uncomfortable with folks who are different from them. CJ: Why were you fired from HP? CF: I was fired because of a dysfunctional board. We had people in the board room who wanted things to happen a certain way. They were wrong. They were being resisted. So they chose to take matters into their own hands and talk to the media to put pressure on the situation. My response was that it was dishonorable and unacceptable behavior. Other people's ambitions took over and other people decided they could take advantage of the situation. That dysfunction, which happened in a two-week period, caused me to be ousted. CJ: There are rumors you might go back to the corporate world or even into politics. I know that you are involved with Steve Case's [new company] Revolution. CF: One the great joys of my life—one of the great gifts of getting fired from HP—is the freedom to do what I choose. I am reveling in that gift. I do a lot of pro bono work. I serve on a lot of boards, of which Revolution Health is one. I do a lot of speaking around the world; I enjoy that tremendously, because you get into very interesting conversations. CJ:Would you run for office? CF: Maybe someday. I admire people who put themselves out there. CF: I've come to the point in my life where that question is so polarizing, I don't even answer it. CJ: Let me ask you the toughest question: Can anything be done about SPAM? CF: I don't know, but my guess is, yes.